This partnership between Nthwese Developments and Twin City Development is expected to create an economic upswing the rural community, says Nthwese Developments MD Mr Seabelo Theledi. 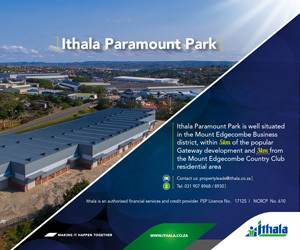 The development has a gross leasable area of 18,500m² and is well positioned in Thulamahashe, a village that feeds the north-eastern Bushbuckridge area in Mpumalanga. Mr Theledi says the company was able to deliver the project in about 13 months. The mall will be anchored by South African retailers Shoprite and Superspar, with the former already ready to trade. As part of boosting rural economy the mall comprises of 8% smaller local retailers, with the other 92% being national retailers. “Our retailers are confident that the centre will have a high level of foot traffic and trading density, given the bullish nature of the area, which is severely underserviced in terms of retail facilities and bulk infrastructure. During the course of the development, the partners factored in bulk infrastructure, such as sewer, electricity and roads, and have upgraded some of this infrastructure for the benefit of the community”. “We’ve embarked on a very inclusive process in this development, ensuring that there’s as much community participation as possible. Unemployment is a big issue in the area and such development brings relief in terms of job creation and sustainability,” Mr Theledi says. Mr Theledi acknowledges the role of the government, its partner Twin City Development, various stakeholders and the community of Thulamahashe.